The design depicts an armored Knight with a fearsome mace riding a large sea turtle. This unique weapon system is superimposed over a target. The Knight portrays the crew of our aircraft; he is the legendary protector of freedom and honor and exemplifies today’s Naval Aviator. The Knight is holding a mace, an ancient and foreboding weapon. In medieval times, the mace was as feared in the hands of a skillful Knight as our modern air-to-ground weapons are today. The mace is an excellent symbol of our powerful striking ability. The Knight with his weapon is riding a large sea turtle. The turtle is the fabled denizen of the sea whose determination, stamina, and navigational abilities are legend. His heavily armored shell and close association with the sea, as well as his always being on the surface of the land or in the sea, aptly symbolize our Navy attack aircraft with their reliability and low level capability. The turtle’s inclusion in the patch is not meant to indicate lack of speed. Unlike his brother the land tortoise, the sea-turtle is a capable and speedy performer when in his element, the sea. The entire weapon system, mace, Knight, and turtle are superimposed over a target. They have arrived at their objective and destruction of the target is inevitable. Attack Squadron FIVE TWO (VA-52) has had a long and distinguished history as an integral part of Naval Aviation. The squadron's roots can be traced back to shortly after World War II with the commissioning of Reserve Fighter Squadron 884 flying the F4U-4 Corsair. The "Bitter Birds" of VF-884 were called to active duty as a result of the Korean conflict, and they conducted their first combat operations in March 1951. During the command's second combat deployment to Korea, the "Bitter Birds" were redesignated as the active duty squadron VF-144. In February 1953, VF-144 completed its second combat tour, and shortly thereafter transitioned to the F9F-5 Cougar. The "Bitter Birds" made two peacetime deployments to the Mediterranean and Western Pacific and transitioned to the F9F-8B Cougar in April 1956. VF-144 made one more WestPac cruise on the USS HORNE (CV-12), and their final deployment bringing the USS RANGER (CV-61) from the Atlantic to the Pacific Fleet in August 1958. On February 23, 1959 VF-144's mission was changed to Attack and the "Bitter Birds" were redesignated as the VA-52 Knightriders. Now flying the A-1J Skyraider (designated at the time as the "AD-7"), the Knightriders made four deployments to the Pacific aboard USS TICONDEROGA (CV-14) and USS LEXINGTON (CV-16) prior to making their first combat cruise to Vietnam in 1964. The Knightriders provided air support during the torpedo boat attacks on the USS MADDOX (DD-731), and were involved in the initial retaliatory strikes against North Vietnam following that incident. VA-52 made two more deployments with the Skyraider to Vietnam before entering the jet age with the advanced A-6A Intruder on 10 November 1967. The Knightriders also made a squadron move to NAS Whidbey Island that same year. The Intruder's side by side seating enhanced its ability to fulfill its primary mission: A true medium-attack, all-weather capability. The Intruder utilized its advanced radar to navigate through mountain valleys at low levels in order to minimize the aircraft's risk from enemy radar-guided missiles. The Intruder could carry a large payload over long distances and deliver its weapons more accurately than ever possible before. On September 7, 1968 VA-51 made its first Vietnam combat deployment with the Intruder aboard the USS CORAL SEA (CVA-43) with Carrier Air Wing 15. The Knightriders again saw combat in Vietnam during their next two cruises with Carrier Air Wing 11 aboard USS KITTY HAWK (CVA-63). On their second Kitty Hawk cruise the Knightriders flew the improved A-6B and were introduced to the KA-6D tanker. In January 1972 the Knightriders left for a one-month de­ployment aboard USS KITTY HAWK that lasted for 11 months. North Vietnam had invaded South Vietnam and CVW-11, with the Knightriders, began the first sustained air operations over North Vietnam in over three years. The Knightriders participated in all of Operation LINEBACKER I. Among their tasking they were responsible for mining many of North Vietnam's harbors and inlets, including Haiphong. During that cruise, VA-52 averaged over 1,000 flight hours per month and in one period flew 1,300 hours in 26 days. While flying more than 3,000 sorties over North and South Vietnam, they delivered over 12 million pounds of ordnance in 160 days of combat operations. Using the A-6B version of the Intruder, the Knightriders shot 113 Standard Arm missiles at enemy radar defenses. As a result of their mini-cruise extension, VA-52 became the most decorated Intruder squadron and for its sustained efforts was awarded the Naval Air Force Pacific Fleet Battle Efficiency Pennant for 1973. In November 1973 the Knightriders, aboard USS KITTY HAWK, began their first peacetime cruise in over 10 years. In July 1974, they were the first West coast squadron to transition to the A-6E. They deployed with their new A-6Es aboard KITTY HAWK in May 1975 and returned to Whidbey in December 1975 to transition to the advanced A-6E with the Carrier Aircraft Inertial Navigation System (CAINS). In October 1977, VA-52 began its third peacetime cruise with CVW-11 onboard KITTY HAWK, returned to NAS Whidbey in May 1978, and then joined CVW-15 that July. In May 1979, the Knightriders headed west again, onboard KITTY HAWK, and in November, under President Carter’s orders, sailed into the Indian Ocean in response to the Iranian hostage crisis, where they remained until returning to Whidbey in February 1980. In early 1981, the Knightriders were awarded the 1980 CNO Safety Award. In April 1981, the squadron deployed onboard KITTY HAWK for a seven month deployment that included two Indian Ocean line periods which each exceeded 60 days, and two months in which over 700 hours each were flown - the most since the Vietnam War. The Knightriders returned to Whidbey in November 1981 for a breather. During their turnaround, the Knightriders passed six years of accident-free flying while engaged in extensive training in 1982 and 1983 for an around the world cruise on board the USS CARL VINSON (CVN-70). On March 1, 1983 VA-52 deployed aboard CARL VINSON to the Mediterranean, their first deployment with the A-6E TRAM. This new version of the Intruder had a Forward Looking Infa Red sensor, greatly increasing the crew's ability to identify and prosecute targets at night. It also had a laser used for precise ranging information and designating targets for laser-guided weapons. 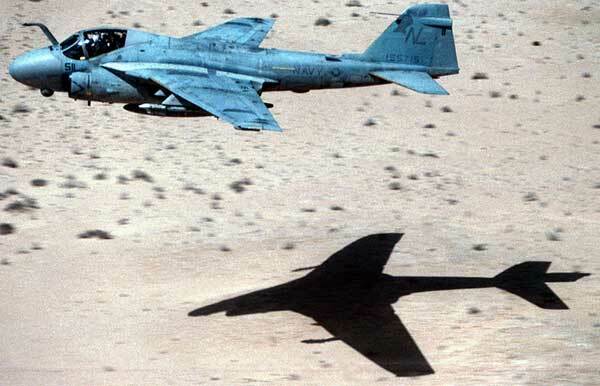 These improvements made the A-6E TRAM one of the most capable attack aircraft in existence. It was in this new aircraft, on on CARL VINSON, that they saw the bombing of the U.S. Embassy and the crisis with the United States Marine Corps in Lebanon. VA-52 made eight deployments aboard CARL VINSON, deploying to the Western Pacific, Northern Pacific, and Indian Ocean numerous times. They participated in RimPac 84, ReadEx 4-84, Earnest Will Ops, PacEx-89 and Team Spirit '90. After nine deployments on a nuclear carrier, they once again changed their address. The Knightriders returned to USS KITTY HAWK on October 18, 1991, where they cruised around The Horn, returning KITTY HAWK to the West Coast. On November 3, 1992, the Knightriders deployed to the Western Pacific, Indian Ocean, and the Persian Gulf where they spent a great deal of time involved with Operations Restore Hope off Somalia and Southern Watch in Iraq. The Knightriders saw combat again on January 19, 1993, as they struck targets deep in Iraq. Their performance was nothing less than superb, hitting all targets assigned to them with laser-guided bombs. On June 24, 1994, the Knightriders began their last crusade with CDR Rivers Cleveland at the helm. They no longer had the KA-6D aircraft, but the A-6E SWIP with Night Vision Goggle (NVG) capable aircrew and aircraft. The made the Knightriders the most combat-capable squadron ever to fly the venerable Intruder. VA-52 was the first A-6 NVG squadron on the West Coast. CDR Cleveland and the Knightriders deployed to the Western Pacific, Yellow Sea and the Sea of Japan where they stood watch over the heated Korean Peninsula. The squadron returned from their final cruise late in December 1994 and began the somber task of decommissioning. In April 1995, the final chapter of the Knightriders was written. Their history is long and distinguished. Their combat record is impeccable. There have been a total of 32 Commanding Officers of The Knightriders. The first, CDR A. S. Tadeo served from 1959 to 1960. The last was CDR C. R. Cleveland. He served from 1994 to 1995. 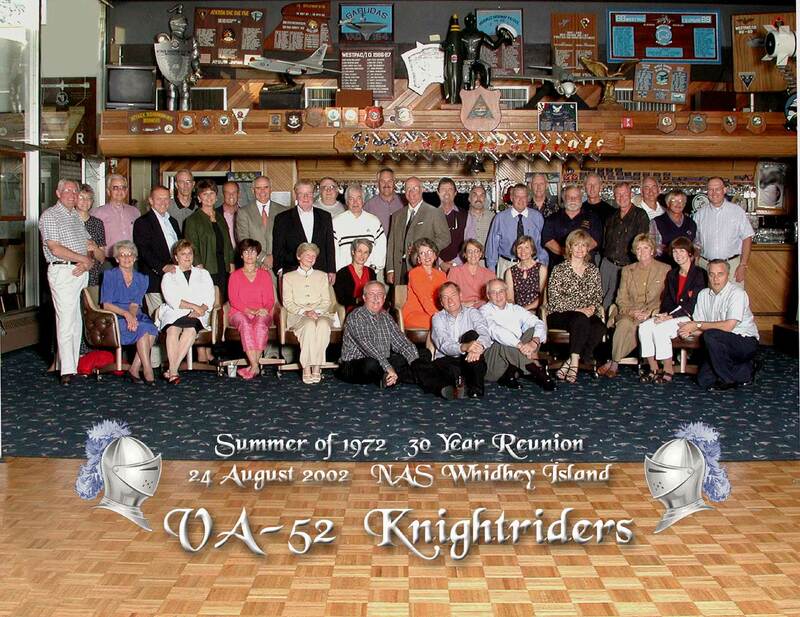 The "1972" Knightrider aircrews celebrated a reunion in February 1991 and a thirty-year reunion in August of 2002. 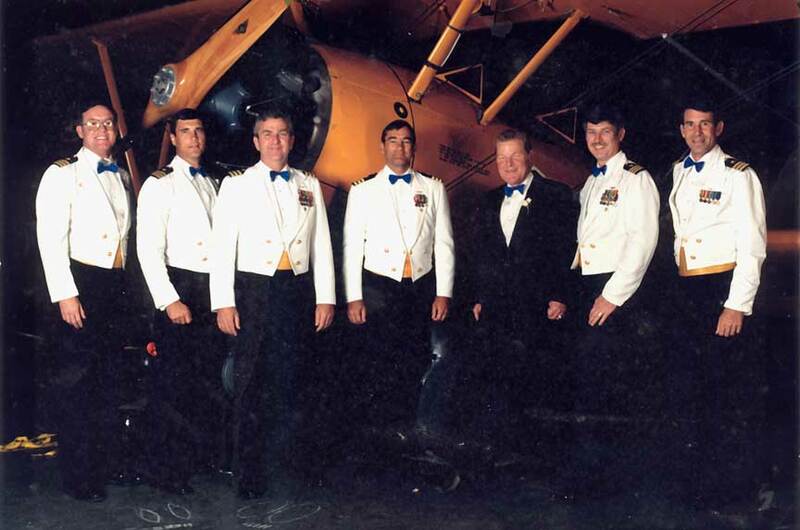 Photo #1 (West Coast Intruder Ball, circa 1987)...all VA-52 former COs. (Left to right); CDRS Rich Dodd, Lloyd Sledge, Bruce Wood, Dave Waggoner, Jim McKenzie, Don Sullivan and Jim Burin. Photo #2 VA-52 Disestablishment - March 17, 1995...all VA-52 former COs. (Left to right) Rivers Cleveland, Jim Engler, Jim Zortman, Tim Thomson, Rich Dodd, Don Sullivan, Bruce Wood, Dave Waggoner, J.R. McGuire, Daryl Kerr, and Jim McKenzie.